It’s a known fact that Dubai is the world’s 10th busiest airport and that managing the airport traffic is no less than a herculean task. The Dubai airport immigration process is known worldwide to take least time in clearance. The efficiency of the management can be seen during the Dubai Shopping Festival when millions of tourists throng the Dubai Airport Immigration lines. When you are standing in the queue of immigration, is there something you can do to make this process even faster? Or if you’re planning to visit Dubai, do you know how it works? Read on to know everything related to Dubai Airport and its immigration. The largest airport in the Middle Eastern hub, Dubai airport has DXB as its symbol. It has three terminals – 1 2 and 3. The terminals 1 and 3 are interconnected and boasts of lavish design and architecture. To reach the terminal 2 shuttle buses are available. Terminal1: classified as the main terminal of the airport, terminal 1 is the destination for all the major airlines coming from all parts of the world. One of the best lounges are operational here and services offered are best for business and first class. Terminal 2: it covers one of the major FlyDubai airlines of the country along with many major low cost carriers. It covers all major flights from Iran and CIS (former Soviet) countries. For the rich and famous using the chartered flights also, Terminal 2 provides its services. However, since most tourists don’t see this terminal, no lounge is operational here. Terminal 3: the all exclusive terminal of the emirates caters to the departure and arrival of all the emirate flights. Considered as the most lavish of all the 3 terminals, it boasts of 4 plush lounges. While 2 are exclusively for business and first class passengers, the other 2 can be booked in advance. These lounges offer exceptional hospitality and relaxation services. You can also book them in advance. If you have been sanctioned a Dubai Visa, it means all the necessary documents are already in place, have reached to the authorities and duly verified. Now all you have to carry is your original passport and the Valid UAE Visa. There are a few countries in the world which do not require any prior visa to enter the emirate of Dubai. The countries allowed for a free visa on arrival at the entry ports of UAE are United Kingdom, United States, Germany, Italy, Netherlands, Luxembourg, France, Belgium, Switzerland, Sweden, Austria, Portugal, Denmark, Norway, Greece, Ireland, Iceland, Monaco, Spain, Finland, Andorra, Vatican, Liechtenstein, Marino, New Zealand, Australia, Brunei, Japan, Singapore, San Marino, South Korea, Malaysia, and holders of Hong Kong SAR passports. Dubai airport has a free shuttle bus service running 24 hours a day to provide transportation to the passengers from one terminal to the other. Although, signs and boards are easily visible all throughout the airport, every terminal if full of information desks looking for offering any help needed to first time passengers. In case you have a long haul before the next flight and want to get rid of the responsibility of carrying luggage all around, you can use the baggage storage area located at the Terminal 1 and 3. At the Terminal 1, you can find it near the RTA taxi area and at Terminal 2, you will have to go near the washroom area. You can store your baggage for approximately $5 up till a span of 12 hours. •Until it is a special month of Dubai shopping festival, try and book your flight during the non- peak hours i.e. between 10am till 4pm. During this time the rush is relatively low and the queue moves faster than the other hours of the day. •While it sounds a bit funny, it really pays off to sit in the front side seats of the airline. The passengers on the front seat gets down faster, are able to catch the first transport shuttle and is always ahead in the immigration queue. If you get a chance to select the seats of the airline, there’s no harm in selecting the seat that will for sure give you a first mover’s advantage. •Travelling with a hand baggage can actually bring you to the very first of the line as compared to your fellow passengers. While they have to wait for their luggage and pay the extra luggage charges and checking etc., you’ll be whisked away to the immigration line way too soon. •Many places offer a fast track immigration service for business and first class passengers. You have to pay a bit extra but then it saves a lot of your precious time. 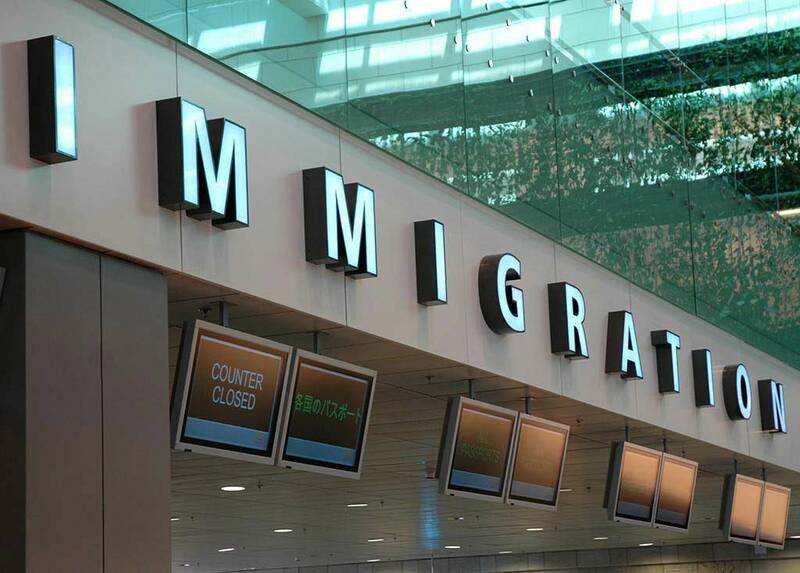 Do ensure to inquire about the fast track immigration charges beforehand to be prepared and avoid the long queue. Dubai immigration is faster as compared to many leading airports in the world. On an average, an officer takes about 3 to 4 minutes to clear a passenger which is no mean feat considering the fact that the visitors have to go through an eye scan too at the time of immigration.